The Nahe River has its source in a valley meadow surrounded by woods at the foot of one of the southern branches of the Hochwald mountain range (Schwarzwälder Hochwald), not far from the village of Selbach (460m). The source of the Nahe lies in a shady grove, which is refreshingly cool in summer. 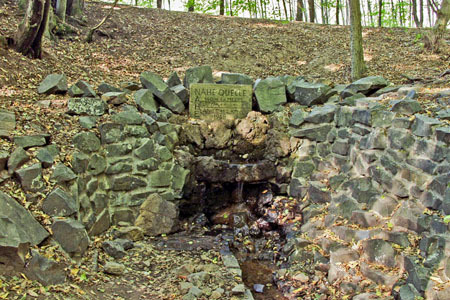 In 1968 the water was redirected and since then flows from a pipe fixed in rustic-style granite stonework. When you see the fine trickle escaping from the pipe, you are surprised that it doesn't simply drain away into the earth again, but instead, under the name "Nahe", successfully begins its 112km long journey. If you follow the "young" Nahe from its source to Selbach (where the first bridge is) and from there on to the hamlet of Elsenbergermühle, you will be surprised to discover how quickly it widens in these first few kilometres, fed by several tributaries from the surrounding mountains and valleys. Actually, the Nahe is responsible for drainage in the entire area. It is therefore not surprising that this stream becomes a proper river, which was powerful enough to burrow a bed through the geologically very hard rock near the narrows of Idar-Oberstein, Kirn and Bad Münster am Stein over a millennium. It is also powerful enough to cross the wide lowlands of the Kreuznach basin and reach the Rhine near Bingen. A few kilometres downstream from Selbach, some of the tributaries of the Nahe from the Hunsrück mountains have been dammed. This has created Lake Bostal, a popular swimming and recreation area in the region. The village of Bosen on the north shore of Lake Bostal is the end of the "Street of Sculptures" (Straße der Skulpturen). This name comes from the 51 sculptures, carved in stone, along the Saarland circular hiking path between St. Wendel and Bosen, which were created by 48 artists from 11 countries. The "Street of Sculptures" was officially opened as an open-air museum in 1979 subsequent to several artistically creative periods and was dedicated to a Jewish sculptor, Otto Freundlich, who was murdered by the National Socialists. The concept of an open-air museum originates from Leo Kornbrust, one of the sculptors from St. Wendel. The creative aim of the project is for the artwork and landscape to merge into a unity. On the north shore of Lake Bostal is the "Bosener Mühle" art centre, where there are not only exhibitions and concerts but also courses in graphic design, sculpture and painting are offered. The latter is primarily based on ruddle, a material known since the Middle Ages that has a particularly warm, red colour and can be individually variegated with the finest nuances.